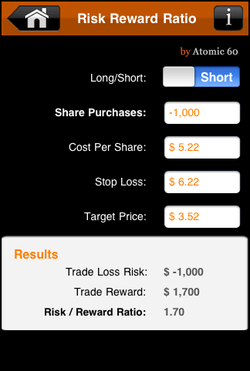 Risk Reward Ratio, also know as the R- Multiple, assesses the profitability of a trade to its' overall risk. The resulting Ratio needs to be higher then 1. A Ratio of 1 means the trade is break-even. Anything lower then 1 is a losing trade. I am Long 1,000 ABC shares at $5.00 per share. My Stop Loss is $4 and my Target is $7. This results in a Risk Reward Ratio of 2.00 meaning that for every $1 dollar at risk I will be rewarded with $2.00.